The picture shows Leif Ericson´s Viking boat on the high seas. 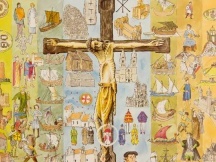 Leif was born in 975 A.C. on Iceland and already at the age of ten he sailed to Greenland with his father. You can see the Viking boat with red-and white striped sails and the rowing crew off the North coast of America. Their leader is standing at the head of the boat pointing to the coast. Seagulls are surrounding the boat. The Vikings were probably the first Europeans who reached the American continent. 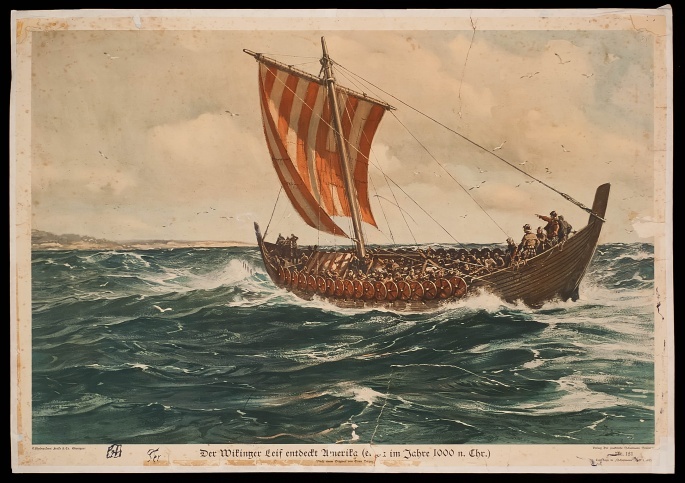 Around the year 1000 the Viking Leif sailed to America on a longship with 35 men.